It was the press conference heard 'round the world -- or at least around the country and in every corner of Nevada. Last Tuesday, four Nevada clergymen stood side by side with organizers of the Nevada initiative to regulate and control marijuana to publicly endorse the measure. 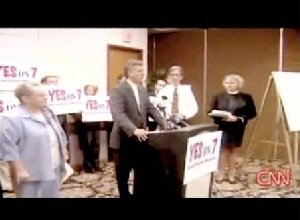 They spoke for at least 33 Nevada clergy who endorsed Question 7, as the initiative is known on the ballot. Preachers for pot legalization -- for the media, that was as good as man bites dog, and the press coverage showed it. 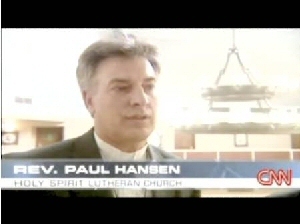 According to a list compiled by the Interfaith Drug Policy Initiative (IDPI), who spearheaded the effort of bringing the clergy on-board, media hits included CNN, MSNBC, every major newspaper in Nevada, repeated features on Nevada TV stations, and an Associated Press story that was picked up by at least 37 media outlets nationwide. The faith-based support is providing a boost for a campaign that is in a tight uphill battle to put Nevada over the top as the first state to vote to regulate and control marijuana, said initiative supporters. "To have so many people in the faith-based community who represent so many denominations is a big plus for the campaign," said Patrick Killen, communications director for the Committee to Regulate and Control Marijuana (CRCM), the group behind the campaign. "Having these people of faith come forward on this shows that creating a sensible alternatives to our state's marijuana laws is an issue that resonates with a diverse array of people in Nevada," he told the Chronicle. Since Jesus HATED hypocrisy, you'd think any serious Christian would be terrified of supporting alcohol supremacism. For many years we religious people have condoned by our silence the fact that our government, in our name, has been tearing good, decent people away from their families and locking them in steel cages for using Marijuana in the privacy of their own homes. Their wives and children are often forced into poverty, sometimes their houses and cars confiscated. It is time for us to end our silence. The Bible calls it 'canna bos'. This is mistranslated in the King James version as 'calamus'. Marijuana use in the U.S. is getting higher each year!! It is about time that a state do something about the fact that one of the most useful plants on the earth is ILLEGAL to obtain, grow, or SMOKE!!! I'd like to thank Rev. Paul Hansen, and hope that Nevada and every other state legalizes the mary jane SOON!!!! I've analyzed this before: Ready for the summary? Here goes: Can you HANDLE the truth? The truth will set us free! Genesis 1:29 Look at how long it took St. John's Wort to become legal. All herbs become instantly decriminalized, or else tear up your Bibles. MJ was just proven to NOT cause cancer, CANNOT as it kills cancer cells! Cancer won't grow or develop, something like that, someone look it up please. Therefore why is tobacco so legal? the creative and wonderful incense of the LORD thy God. Or they tried to. Stores like Walgreens if drugs are so bad? The $$$ and non-compassion. at high prices, not compassionate, like God grew his good herbs. many of the pharms come from, don't they? Quit holding God's herbs hostage! Island MEDAL for especially brutal soldier activity. LOOK IT UP I DID. the MEDALS given to the soldiers! Probably got big fancy ties for killing Jesus! Religion needs to do an about face and pull their head out of their traditions. It has been proven by scientists that certain parts of your brain only respond to marijuana use. This means that 1.) God made a useless part of your brain 2.) God made a mistake or 3.) God made it so that you could smoke marijuana. I'm sort of leaning towards 3. I hope that helps to add to the good fight. I recently moved to Nevada from California where I was injured at work. they tell me I have tendinitis from the elbow down to my fingers in my dominant arm. I have tried just about everything to get rid of the pain I go through on a daily basis. I have tried morphine, Vicodine, extra strength vicodine, physical therapy, Ibuprofen, Tramadol, and many more things to help cope. so far the only thing that helped was MJ it helped me from having to go to the hospital many times. due to the pain I get very ill and when it gets to bad I suffer from dehydration because I can't keep anything down. Now in this state if I am found with it on me I go to jail. Tendinitis is something I will deal with for the rest of my life and they tell me that there is nothing other then surgery that will help and I am not yet bad enough for surgery. so what is a person in my situation supposed to do. I can't afford to keep going to the hospital. I can't even work at the moment. Marijuana is not a drug man labeled it a drug. God said that it was a herb. But man corrupted it and decided to smoke it. That wasn't what god had intended for it says in Genesis 1:29 And God said, Behold, I have given you every herb bearing seed, which is upon the face of all the earth, and every tree, in the which is the fruit of a tree yielding seed; to you it shall be for meat. Think about it you are suppose to season your meat with it and eat the meat. people made it a drug God made it a seasoning for food. Get a clue you eat not smoke it. The traditional prohibitionist arguments successfully penetrated into the Christian religious leaders, who propagated the misinformation throughout the Christian community. We need to set things straight with people out there. Jesus and Marijuana Legalization go hand in hand. Jesus was about having compassion and mercy for those suffering and sick. Some Christians make the argument that people who consume medical marijuana are evil. This is not the basis for evil and is pure fiction. Bad people lack a conscience, do not know God and have no Biblical understanding. What about all the good people that consume medical marijuana, and have accepted Jesus. Thankfully salvation is available to all regardless of what superstitions these religious fanatics hold onto. We know our God, and he is for good. We also know that he has called us to help and bless those with need. Heavan is open to all. Exodus 1:16- And he said, When ye do the office of a midwife to the Hebrew women, and see them upon the stools; if it be a son, then ye shall kill him: but if it be a daughter, then she shall live. Would you also support the death of first born males in a genocide? Would you support denying medical assistance to people? Well, not if you really are a good person. The plant made by God has its uses: paper, clothing, rope, sails and medicinal uses. This is a natural substance with NO additives that even Queen Victoria used for her menstrual cramps. Why waste money on creating an artificial/synthetic substance that will chance untold side effects NOT present in the God made plant? If the children of Presidents like Jerry Ford, Ronnie Reagan or George Bush can use this in the privacy of their homes, why can't we?